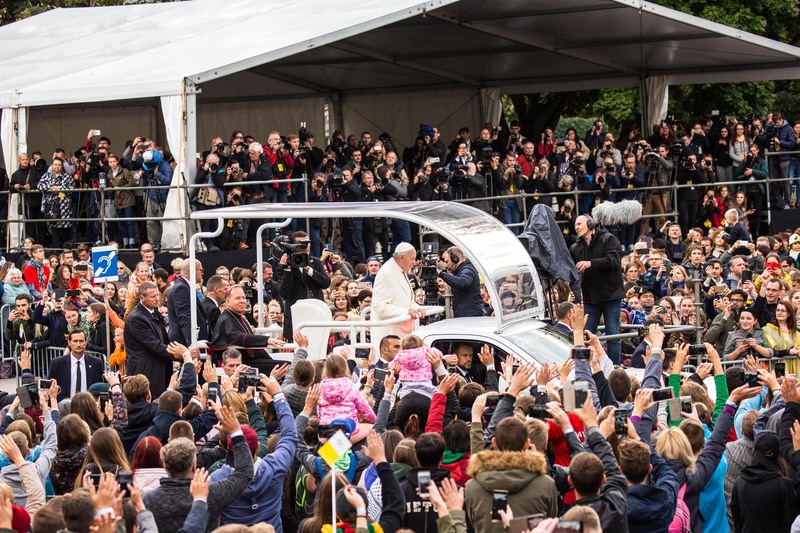 Pope Francis arrived at Cathedral Square in Vilnius this Saturday evening for a special encounter with youth, as a hymn created especially for the occasion, titled “Christ Jesus – my hope”, was sung by the many young people gathered in the Lithuanian capital. An estimated 30,000 people were in the square itself and another 30,000 filled the surrounding areas. The Holy Father always seeks dialogue wherever he goes, and here, too, on taking the stage, he first listened to two testimonials. A young woman, Monika Midverytė, spoke of psychological and emotional violence she had suffered and the suicide of her alcoholic father. Thanks to a Christian community, she managed to accept her father and come to terms with his death. The second to speak was Jonas Davalga, a 35-year-old with an autoimmune disease who is an active and successful businessman. He said he was living through the best time in his life despite his health limitations and the continual risk of deadly complications occurring. At-risk youth and the dance groups Love Air and Gelmė complemented the testimonials with specially developed dance performances. A choir from the Shrine of Divine Mercy also performed a special arrangement of traditional hymns and songs of popular piety. 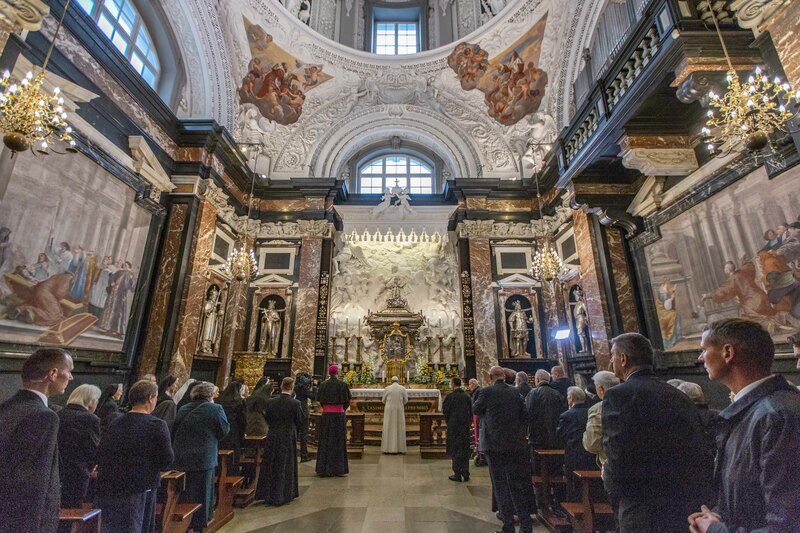 Pope Francis presented Archbishop Grušas with a gift, and after giving his blessing to all those gathered, entered the Vilnius Cathedral Basilica of Saint Stanislaus and Saint Vladislaus and visited the Chapel of Saint Casimir. There, accompanied by elderly religious men and women, he prayed by the tomb of Saint Casimir, a patron saint of youth and of Lithuania. The young people in Cathedral Square followed what was going on inside the Cathedral and prayed along in silence. 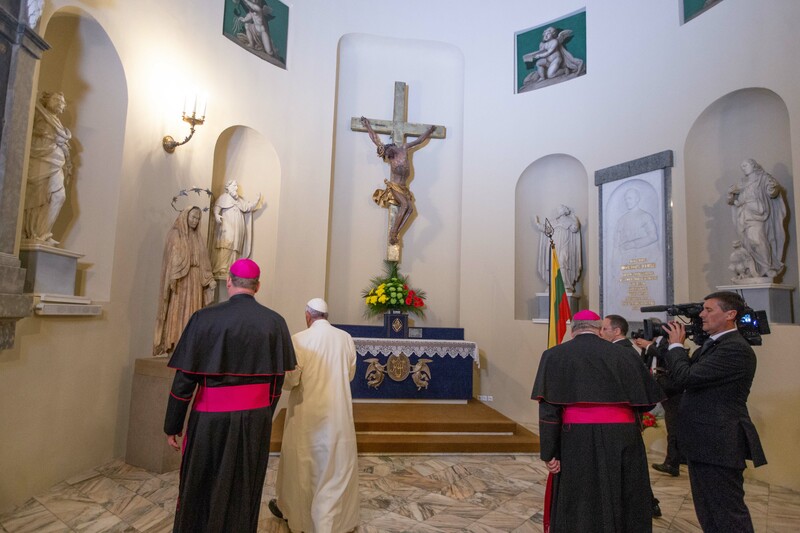 Inside Vilnius Cathedral, Pope Francis also stopped briefly at the Chapel of Exiles, dedicated to all those who were killed, imprisoned or exiled during the half-century Soviet occupation of Lithuania. A statue of Mary known as the Siberian Madonna is venerated in the chapel. The statue was brought back from a cemetery for Lithuanians exiles in Krasnoyarsk region of Siberia. On exiting the organizers of the encounter greeted the Holy Father and, together with all those gathered in Cathedral Square, saw him off. Pope Francis set out by popemobile for the Nunciature, where he is residing in Vilnius.